Because I’m not prepared to spend any longer than 12 hours sitting in an aeroplane, I spent a night in Hong Kong on my way to the UK. 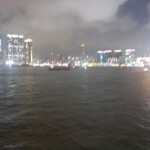 In the past, I have always stayed in Kowloon, which I have got to know quite well over the years. 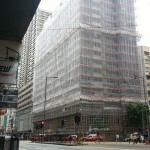 This trip however, I decided to stay on the island, and found a cheap (NZ50.00/night) hotel in Causeway Bay. It isn’t actually a real hotel, it is several floors of apartments, with a notice on the door informing guests that it is unlicensed and that the body corporate takes no responsibility for anything. This is a common arrangement here so I’m not too concerned. Because the dozen or so floors are only served by one working elevator, the wait for it to arrive is so long that I have given up even pressing the button, and use the stairs. Fortunately my room is only on the sixth floor, and it includes a window with a view of the high-rises across the road. I haven’t been able to get hold of a map, so every expedition around the local neighborhood results in me getting temporarily lost in the maze of skyscrapers. 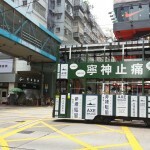 There are plenty of road signs, but since heading east towards Kowloon often requires turning west and looping around they are less helpful than you might suppose. Only occasionally there is a view of the of green hills through the buildings which lets me orientate myself as to which direction the coast is in. 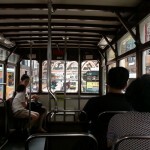 I have been mostly just walking around town, which gets tiring after a couple of hours, but then I discovered that you can hop on any of the double-decker trams running along the main roads, sit watching the town go by as long as you want, then pay less than 50 cents when you get off. 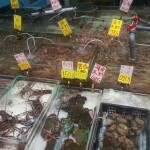 At one end of the line I visited a market, with a fascinating variety of species of sea-life waiting to be purchased and eaten. 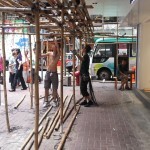 I was impressed to see that the Chinese still use bamboo scaffolding, even on high-rises dozens of floors high. I photographed a team working, with strips of plastic that they use to tie it all together hanging from their belts. 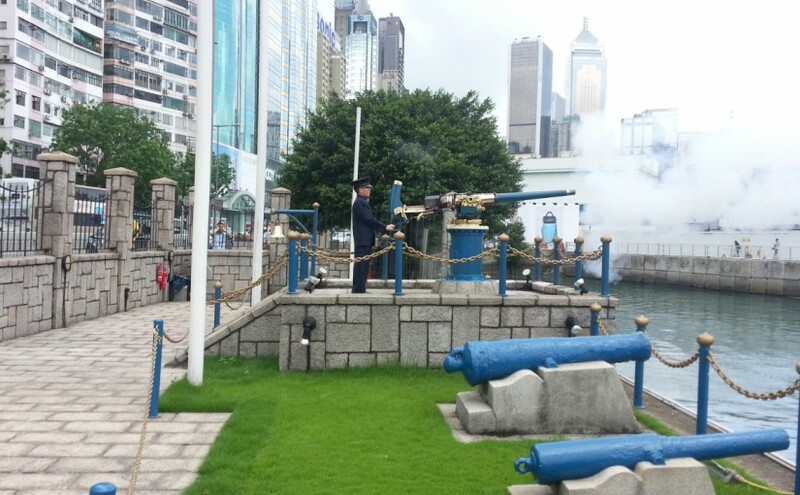 Just down the road from my hotel is the “Noon Day Gun” – which gets fired at mid-day every day. 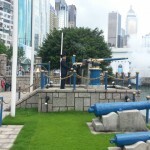 I assumed it was a military tradition, but it turns out the gun is owned the multinational company Jardine Matheson, who annoyed the British Navy by firing guns when the boss sailed in to port and as a result were required to fire a salute at mid day in perpetuity. There are quite a few signs in surrounding streets, which sparked my interest, but getting to the gun involves a complicated route down stairs, through an underground car-park and along a tunnel beneath a busy road. I went and watched the gun being fired, blissfully unaware that my plane for London was departing in 20 minutes. I left from NZ at 11.20 pm, and foolishly assumed that 12.20 pm would be an hour later, when of course the difference is actually 13 hours. I was in for a shock later in the evening when I arrived at the airport thinking I had plenty of time to check-in! 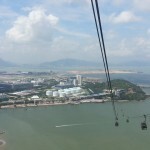 In the meantime, I took a trip on the cable-car from Tung Chung to the village of Ngong Ping, 5.7km away on the top of a hill. 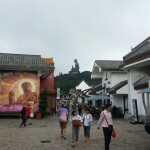 I walked fairly quickly through the “traditional Chinese village”, with its traditional Starbucks, Subway and Pizza Hut outlets, and climbed the steps to a huge Buddha on the peak of the hill. It was very pleasant to be surrounded by open, green country after the concrete canyons of Hong Kong. When I arrived at the airport and realised how dumb I was, I spent a frantic half hour trying to re-book with Cathay Pacific, who told me that they couldn’t change an Air New Zealand ticket and sent me to Jardines at the other end of the terminal who are the Air NZ agents. They also couldn’t help because they don’t have access to the booking computer, so they sent me to a free phone where I could dial a local number and connect to Air NZ back in Auckland. Then I had to spend 10 minutes listening to a soothing Maori song until finally a friendly woman with a kiwi accent answered and issued me a new ticket. The first confirmed flight I could get on was the next morning, but I returned to Cathay Pacific and got put on the standby list for a flight departing just before midnight, about the time I expected to leave. I then invested in a $20 shower for the benefit of my fellow passengers – the temperature had been 32 degrees so I was rather hot and sweaty after my adventures (and stress). At 11.00 pm I learned that there was a seat available, so it all worked out in the end. Good to hear your news. Glad you managed another flight. Enjoy it all. Love to you and F.